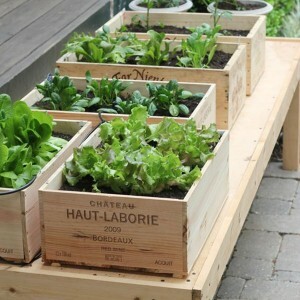 Spring has come so late this year that I am way behind on my planting, gardening, and outdoor cleaning! 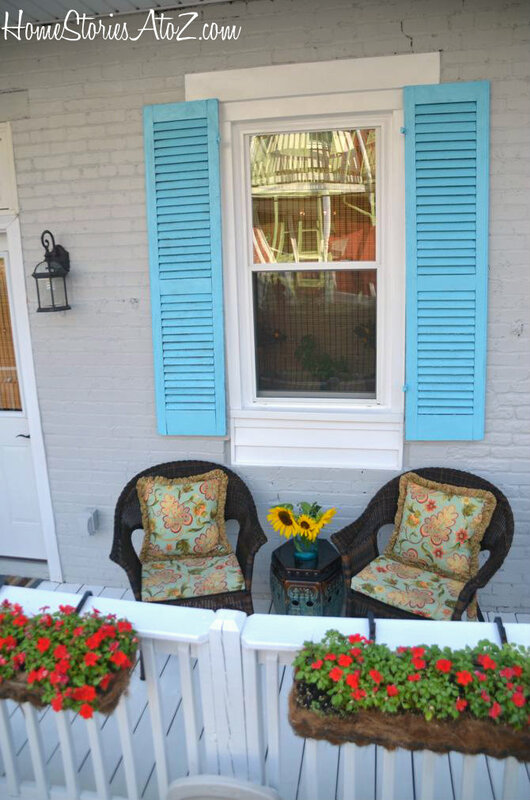 We live in the city with a very tiny backyard, a front porch, back porch, bedroom balcony, and roof deck to maintain. Unfortunately, the harsh winter really took its toll on all of our outdoor surfaces. This past weekend, I began the difficult task of cleaning everything. With the continual grime of urban life I am always looking for practical methods to remove dirt and stains from outdoor surfaces. Scotts® Outdoor Cleaner Plus OxiClean™ asked me if I’d be willing to test their product, and I accepted the challenge! 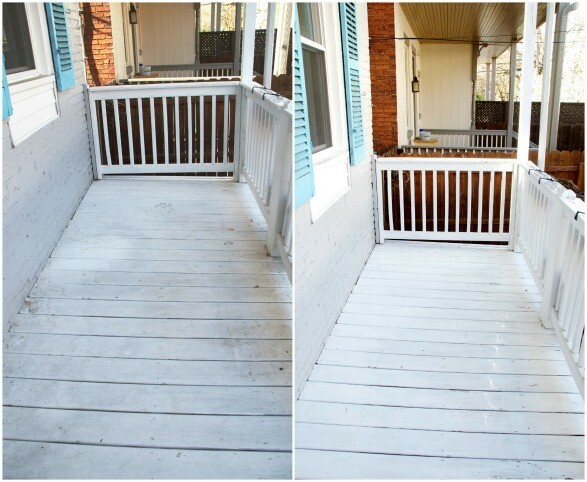 Here is a decorating tip for you: NEVER stain a porch floor white. This has to be the dumbest decorating decision I have ever made. I plan to restain the porch floor a dark gray soon, but in the meantime the poor floor needed some serious cleaning. I first swept the large debris off of the porch and then hosed off the entire surface with water to remove some of the grime. This step is not necessary but it just made be feel better so I did it. Next, I attached a bottle of Scotts® Outdoor Cleaner Plus OxiClean™ and thoroughly sprayed the entire porch, door, brick, and vinyl. The product has a fast-foaming action that starts working immediately. Unlike bleach, there isn’t a strong odor, it will not harm fabrics, and is safe to use around grass and plants. I DID have to scrub to obtain the best results. You can’t just spray and be done if there are tough stains like you see here. I used a deck scrub brush to work the product into the surfaces, and then I rinsed everything thoroughly. 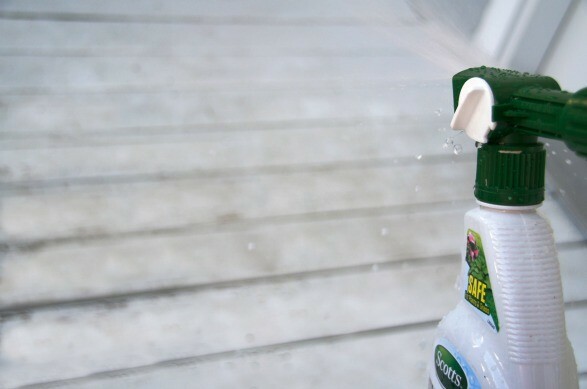 This product will lift stains from moss, mold, mildew and algae which is a huge plus! 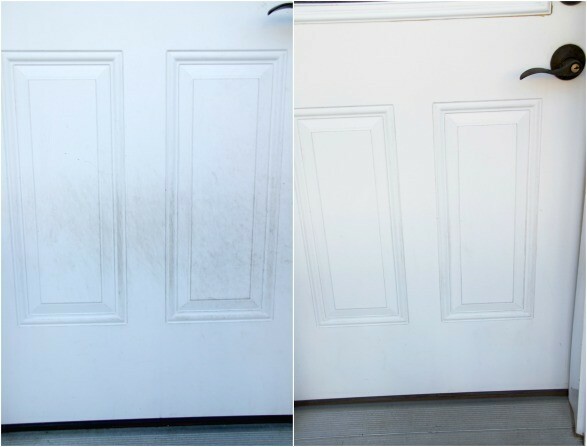 You can see how well Scotts® Outdoor Cleaner Plus OxiClean™ worked on my vinyl door. My little Pomeranians jump up on this door with their muddy paws to “knock” when they want to come back inside. And here is the porch floor looking fresh and sparkly after its cleaning! Do you have some tough outdoor stains to tackle this spring? Enter the giveaway below for your chance to win a $50 American Express gift card which will help you spruce up your outdoor surfaces for spring! If you’re wondering where to find the product, it is available to purchase at the Home Depot, Lowe’s, and Walmart. I couldn’t find mine at Walmart but there was a huge display of the product at the front of my Lowe’s. Check your local store for availability. Scotts® Outdoor Cleaner Plus OxiClean™ is available in a 1 Gallon concentrate, a 32oz Ready to Spray hose end bottle, and a 32oz. Ready to Use trigger sprayer. Each bottle of concentrate makes up to 10 gallons of cleaning solution and is safe to use with power washers. Be sure to follow the instructions on the packaging and scrub for best results! 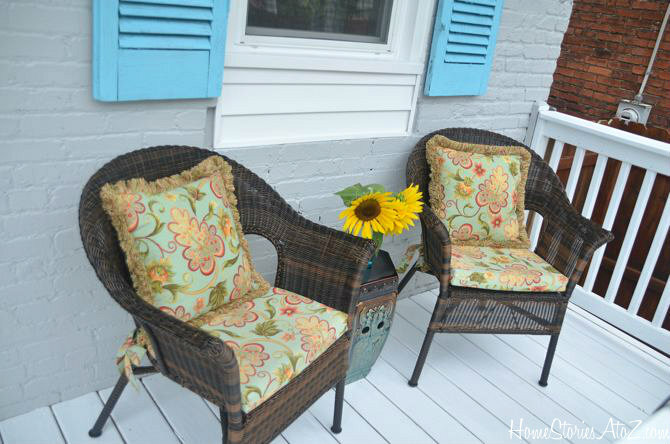 Happy cleaning and outdoor living! To enter giveaway, please follow the prompts in the Rafflecopter widget below. OxiCleanTM is a trademark of Church & Dwight Co., Inc. and is used under license by the Scotts Company, LLC. This is a sponsored conversation written by me on behalf of Scotts®Plus OxiClean™ Outdoor Cleaner via Burst Media. The opinions and text are all mine. I love the results on the vinyl door! I did mine recently and realized I should’ve done it a long time ago – some of that stuff won’t go away! After the last storm I have serious dirt issues with my porch, so I will give this cleaner a try in the weekend. Hope it works, thank you for sharing, Beth!